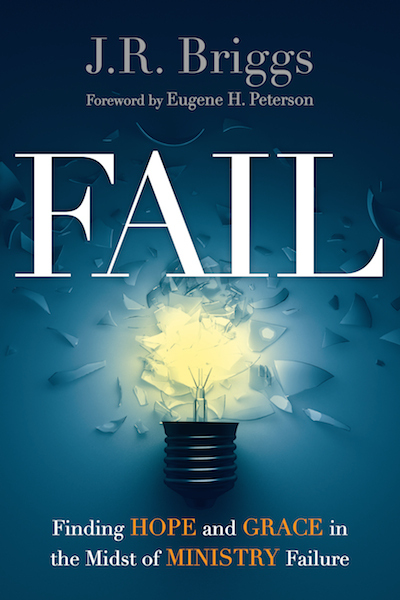 First off, I’d like to thank the kind folk of IVP for a review copy of J.R. Briggs’ newest release, Fail: Finding Hope and Grace in the Midst of Ministry Failure. It’s always a pleasure to receive such gifts! J.R. Briggs serves as Cultural Cultivator of The Renew Community, a Jesus community for skeptics and dreamers – based in Landsdale, PA. He also serves as Director of Leadership & Congregational Formation with The Ecclesia Network. Even more, he’s becoming most known for creating the Epic Fail Pastors Conference and now the penning of this new book. Failure is not an easy word for pastors. Well, that’s probably true of most people! Of course, when many think of failure for pastors, their mind might typically imagine some grave moral failure. And, though, such is true at times, it is a small slice compared to the greater reality that pastors deal with concerning failure. I speak from a bit of experience following a 5-year pastoral stint – in that my battle with failure was not some sexual immoral problem, but rather such things as the desire to not let people down, deep feelings of loneliness, accusations of not handling situations appropriately, challenges of growing as a young husband and first-time father, and much more. I’m no more special in having the opportunity (yes, opportunity) to walk through these challenges. Matter of fact, mine pale in comparison to the situations and stories I’ve heard from friends and ministry colleagues from around the globe. But the emotional challenges connected to feelings of failure is a deep reality in the life of every single pastor on planet earth. Briggs does well to jump into his own story of pastoral failure. His consists of moving from one pastoral situation in Colorado Springs, Colorado, to another in a megachurch based in Philadelphia. The difficulties that ensued over the next couple of years left he and his wife deeply damaged – betrayal, humiliation, confusion, back-biting, with much of it coming from the elders of the church. And to top it off, he and his wife battled infertility. I don’t know that battle, but I can only imagine the gut-wrenching pain of not being able to have your own children (though this gave he and his wife the beautiful opportunity to adopt, for which they are immensely grateful to God). It was great to hear his own story. People relate to stories. Remember that! No matter how left-brained, intellectually-driven and mechanical one is, people relate to stories. So I appreciated hearing Briggs speak about the challenges of his own life. And, though there are other pastor’s stories sprinkled throughout the book, that’s the only thing I wish there had been more of. My story is a combination of 3 and 4, with challenges leading to emotional expressions of anger towards my family. And, though it pains me, I’m finally able to admit these now. As a perfectionist, who had perfectionism instilled while growing up, it was hard to accept failure. And it still is difficult. Of course, all Christians have a theology of sin and we somewhat apply that to ourselves. But many of us have never been gripped with the fact that failure is a reality each and every day across each and every part of life. I don’t say this from a “worm theology” perspective. But, really, if sin is as all-pervading as Scripture makes clear (and our lives make clear! ), then we can, or should, be ok to admit this. We must be ok to admit failure. And Briggs’ book is not really geared towards how we might avoid any of those 4 categories above. Rather it’s written to help those who have walked through major failure and ministry let down, that they might come through on the other side. And that might take a good long while, which is truly ok. When we look at Jesus, we see faithfulness – even unto death. Here was the most “successful” person in the history of humanity. And looking retrospectively at his life, it didn’t look much like success in accordance with our modern-day measurements. of course, as we look at his ministry now, and knowing who Jesus really is, we can say all sorts of things that sound good and spiritual. But imagine one living with the “success” of Jesus in our world today? Yeah, that person, or that community, would greatly ridiculed, I believe. Jesus calls us to faithfulness, not so much fast-growing megachurches with special secrets to success. Of course, numbers don’t necessarily make one primarily about superficial measurements of success. But we still easily get the wrong impression about ministry success, believing that Tim Keller and his church tell a much better story of success (I have nothing against Keller and Redeemer Presbyterian) than, say, Community Baptist Church of small-town, Oakland, TN (if there is such a church). Matter of fact, I think the next book in line – whether Briggs or another pens it – is tracking the life and ministry of 5 or so pastors who faithfully plow every day, but still maintain a congregation of, say, 75 people. No major Auditorium with lights and cameras on the stage; no coffee bar in the foyer entrance; no children’s program that brings in 200 kids per week; no multi-million dollar capital campaign. Just faithful, simple and slow plowing of the field. Such stories need to be heard! And just FYI: the average size of a North American congregation is 75. Of course, none of these stages are completely static, with most everyone flowing in and out of varying stages over their period of grief. I can testify myself that, though I believe I’ve come more and more through the challenges of ministry failure and into acceptance, I find myself sometimes slipping back into either anger or sadness, or possibly both. In all, I recommend this book to all pastors and ministry leaders. It will be of great value to ministry leaders of all types, especially those who have hit the wall of ministry failure and are currently trying to find the depths of grace and solid ground to once again stand upon in Christ. Thanks, J.R., for taking the time to tackle such a difficult, but needed, matter for church and ministry leadership! This entry was tagged book review, books, ministry, pastor. Bookmark the permalink.